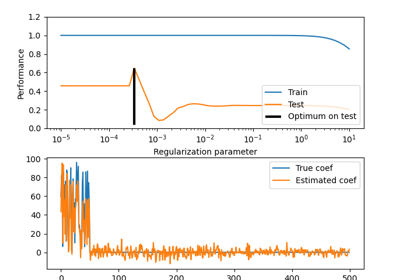 Linear regression with combined L1 and L2 priors as regularizer. The parameter l1_ratio corresponds to alpha in the glmnet R package while alpha corresponds to the lambda parameter in glmnet. Specifically, l1_ratio = 1 is the lasso penalty. Currently, l1_ratio <= 0.01 is not reliable, unless you supply your own sequence of alpha. Constant that multiplies the penalty terms. Defaults to 1.0. See the notes for the exact mathematical meaning of this parameter.``alpha = 0`` is equivalent to an ordinary least square, solved by the LinearRegression object. For numerical reasons, using alpha = 0 with the Lasso object is not advised. Given this, you should use the LinearRegression object. The ElasticNet mixing parameter, with 0 <= l1_ratio <= 1. For l1_ratio = 0 the penalty is an L2 penalty. For l1_ratio = 1 it is an L1 penalty. For 0 < l1_ratio < 1, the penalty is a combination of L1 and L2. Whether the intercept should be estimated or not. If False, the data is assumed to be already centered. Whether to use a precomputed Gram matrix to speed up calculations. The Gram matrix can also be passed as argument. For sparse input this option is always True to preserve sparsity. When set to True, reuse the solution of the previous call to fit as initialization, otherwise, just erase the previous solution. See the Glossary. When set to True, forces the coefficients to be positive. The seed of the pseudo random number generator that selects a random feature to update. If int, random_state is the seed used by the random number generator; If RandomState instance, random_state is the random number generator; If None, the random number generator is the RandomState instance used by np.random. Used when selection == ‘random’. number of iterations run by the coordinate descent solver to reach the specified tolerance. Elastic net model with best model selection by cross-validation. implements elastic net regression with incremental training. 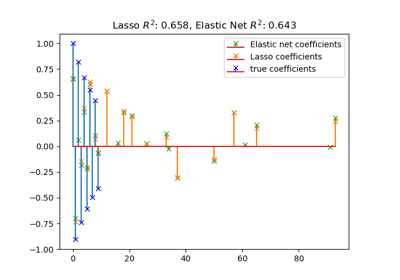 implements logistic regression with elastic net penalty (SGDClassifier(loss="log", penalty="elasticnet")). fit(self, X, y[, check_input]) Fit model with coordinate descent. Fit model with coordinate descent. Coordinate descent is an algorithm that considers each column of data at a time hence it will automatically convert the X input as a Fortran-contiguous numpy array if necessary. To avoid memory re-allocation it is advised to allocate the initial data in memory directly using that format.